As Randall Davis points out plump, red tomatoes growing in a heated greenhouse, it sparked to mind a very recent delivered pizza experience. The added tomatoes, which cost a premium of $1.49, were bland, hard, and barely red. Nothing like the beauties growing at ValleyHUB, a food hub and local grower that is part of the Kalamazoo Valley Community College community. Outside, it's a bleak November day. Inside, these tomatoes are enjoying a warm, August-like growing season. 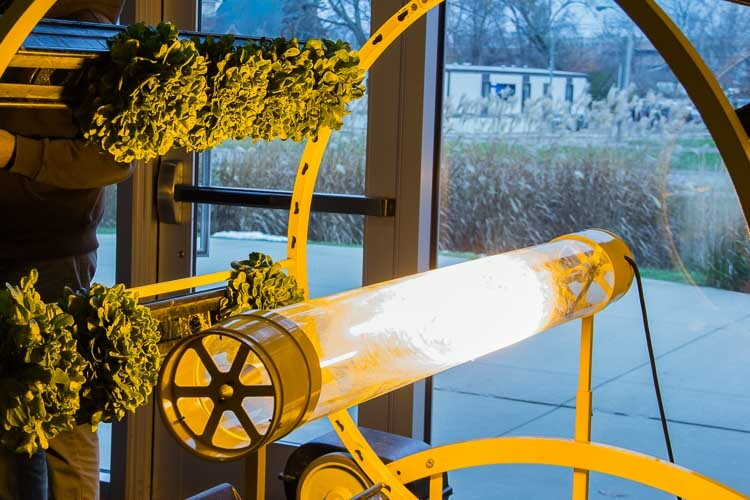 ValleyHUB made a large investment in greenhouse heating, grow lights and indoor irrigation systems, which makes their fruits more expensive than the tomato-like objects shipped from California or Mexico. "We know that there's a market for tomatoes, all year round," says Davis, who is the food hub manager at ValleyHUB. 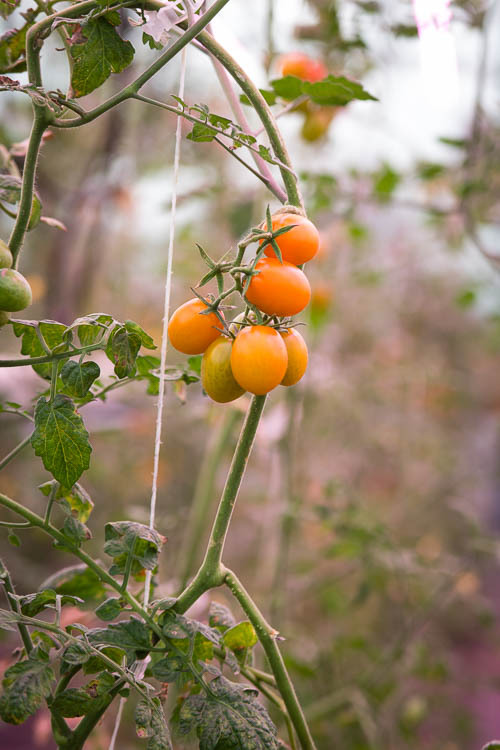 Customers would spend more for a fresh local tomato grown in a greenhouse in winter, than a variety "that's meant to be shelf stable, shipped across the country, picked green, gassed — it's not really a tomato." As food hubs, ValleyHUB and Sprout strengthen the local food economy by increasing access to Michigan foods and supporting local farmers. Food hubs are a relatively new way to get local food from farmers to consumers. As part of KVCC's Bronson Healthy Living Campus, ValleyHUB takes the concept a step further by studying and experimenting to see if the hub system could be truly sustainable in an urban environment. Could a new system get local food to the urban neighborhoods of Kalamazoo, Battle Creek, and elsewhere, where communities are populated by fast-food joints and party stores? Is there any way to bypass the old system to better serve families with low incomes? How can food hubs be fair, yet sustainable, when it comes to the income going to farmers and food workers? ValleyHub has been working on issues of food growing and delivery for just two years, so they haven't solved all food justice conflicts yet. They are studying, and sometimes running into, systemic barriers of the old system. First, they have to have to establish a sustainable business model. ValleyHUB is selling local produce from local farms and their own urban farm to Kalamazoo restaurants and health-focused grocers like PFC and Sawall. In their greenhouse they are growing speciality produce used in Asian cooking for Pacific Rim Foods. But their biggest customer is institutional — their partner Bronson Healthcare in Kalamazoo. Prices tend to be higher for ValleyHUB's products, especially non-seasonal and greenhouse-grown produce. But according to Grant Fletcher, Bronson's system director for healthy living and sustainability, "The notion that the food we're buying from ValleyHUB is more expensive — it's fuzzy." Fletcher wants to give as many people as possible in the Bronson community access to "the fundamental resources that every human being needs to live the healthiest, happiest lives that they can." This philosophy extends to Bronson Battle Creek, which gets fresh produce from that city's food hub Sprout BC. There are times offseason when ValleyHUB delivers product that costs more, but that's not the end of the story. "There may be instances when a carrot from them, grown by Crisp Country Acres of Zeeland, is a couple cents more expensive than a monstrous carrot grown in the central valley of California that we purchase from Gordon Food Services or Sysco," Fletcher says. "We are hyper-aware of the food that we're sourcing, the way that we're managing our inventory, the way that we're treating food as a resource," he says. And that, ultimately, creates less waste. Fletcher says that "99 percent" of what arrives from ValleyHUB is usable. "If a 25-lb. case of tomatoes arrives from Mexico, and they spent ten days on a truck getting here, that case might be 30 percent waste." A bleak November day feels like midsummer to these greenhouse-cultivated plants. At ValleyHUB, workers clean, peel, slice, and clean again locally-grown onions, carrots, and turnips. This is called "light processing," and here there is a purpose-built food processing space. The environment is relaxed, with employees listening to alternative hip-hop. There can be a "toxic work environment" in a lot of kitchens and processing centers, according to Davis. He hopes to show people there is a different way of doing things. "There's a cultural way that's been accepted for a long time," he says, "and now we're at a place where we can shift." They employ a diversity of people, some KVCC staff, some staff contracted from MRC Industries. "We're intentionally placing people who may have barriers to employment in our program," Davis says. Can a food hub system that ValleyHUB is exploring support these workers better than low-wage workers in a large food plant? "I would love to say yes, but the reality is, no. We're not there yet," Davis admits. "And I can say that across the industry, we know that this type of work is not valued, it's not valued by the customer or the consumer, which is the biggest problem. Because if they're not willing to pay what food costs, then you'll never be able to have an industry that can support the workers with a wage that makes sense." It is a goal to find ways to pay their workers a bit better. But ValleyHUB also pays local farmers what they demand, and keeps prices reasonable for their customers. They're also running a nonprofit within a college, not in the open consumer market, and trying to make enough money so as not to put stress on KVCC. Will Lee is food hub assistant at ValleyHUB. But if good, local food is available, will low-income families be able to buy it? Fletcher at Bronson says that everyone from patients to employees to the community they serve deserve high-quality local food. "We want to lift that food up, and in particular we wanted to lift it up in large institutional settings where hundreds if not thousands of people are eating every day, and exposed to that food," he says. "It's one thing for (high-end Kalamazoo restaurants) Rustica or Food Dance to put together a really beautiful plateful of locally sourced food at a price point that a relatively small percent of our population can enjoy on a regular basis." But Bronson and KVCC are getting that locally-grown, high-quality food to people at a price many can afford. "You could walk into these cafeterias and eat a complete lunch for almost $10." Fletcher says that institutions like Bronson purchasing from ValleyHUB, "serve to build the capacity of the hub and the farmers and infrastructure required to support that food system," which helps grocery stores to feasibly sell local foods at a price competitive with national distributors. Fletcher hopes for a day when liquor stores in urban communities could be replaced with food bodegas within walking distance of neighborhoods. Bronson will be taking a small step toward that in January hen they open their own micro grocery store. Year-round, every day, local fresh fruits, vegetables, meats and dairy from local farms will be sold near their hospital gift shop/pharmacy. 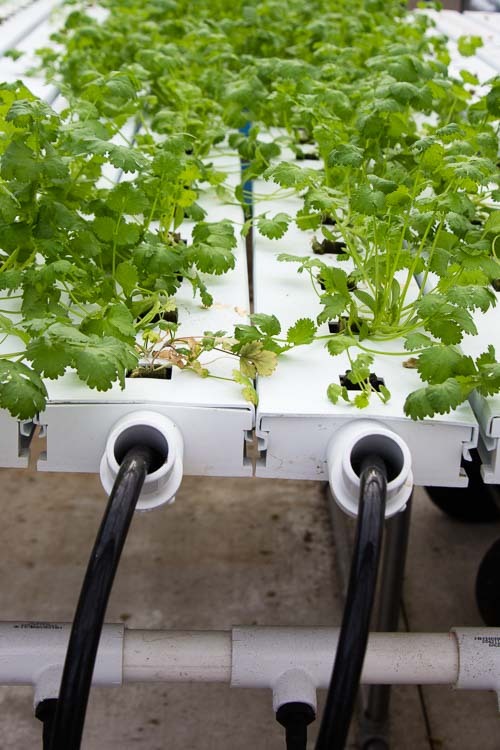 Cilantro grown at ValleyHUB makes its way to Bronson Healthcare. He admits that when people think Bronson, they think of a place for surgeries and sickness, not for food. "That's not generally the place where anyone hangs out unless you have to. But it's a wonderful environment. Lots of parking, tons of food, a lot of it made to order, coffee shops." Sprout BC food hub manager Brennan Dougherty laughs a bit as she says, "You can go into a hospital and have a really fantastic local meal, and it's not a big deal!" She is talking about Bronson Battle Creek, also going into the food business with the same attitude as its Kalamazoo counterpart. The north side of Battle Creek, dotted with fast food chains, now has a hospital where residents often go just to get quality food service, Dougherty says. Sprout delivers potatoes, onions and other staples to Bronson. "We're trying to normalize local food, instead of making it a high end, farm-to-table thing." Dougherty hopes that food hubs can make local food a regular part of everyone's diet, and no longer seen as a "kind of a high-end focus, something that's not accessible." Sprout is looking to do the same with Sprout Box, a delivery service of local produce and products. Battle Creek residents who struggle to find affordable food can use SNAP benefits at their door, since Sprout now has a mobile EBT license. They're looking to expand to Sprout Box delivery in Kalamazoo, while ValleyHUB is looking to bring more wholesale processed produce into Battle Creek, she says. Sprout hopes to work with ValleyHUB to find customers in Kalamazoo, and they’ll do likewise to help ValleyHUB in Battle Creek. It's all in the food hub spirit of collaboration. "We're in Battle Creek so we know Battle Creek. I feel like those connections can help ValleyHUB increase its own business here," she says. "It's good for everyone. We have common farmers who we work with, common businesses that we work with either collaboratively or separately. Our feelings have always been the more local food the better, period." Mark Wedel has been a journalist in southwest Michigan since 1992. For more information, visit his website.